Hydrophobic soils and potting mediums can create havoc for the grower or gardener when irrigation water is repelled from the area they are trying to hydrate, or the water moves straight through the soil profile and is lost to run off. Water repellent soils are formed from the decomposition of hydrophobic (or water repelling) waxy materials originating from plant residues that can coat soil particles preventing the infiltration of water into the soil profile. Soils with a small surface area (e.g. sand) are more prone to water repellence, as it takes less hydrophobic material to coat individual particles, compared to silt or clay. Potting mediums also suffer from this phenomenon as most contain a large percentage of incompletely composted organic matter. Figure 1:- These broccoli leaves demonstrate how many plants & vegetation have a natural waxy component and if mulch is not composted properly will contribute to hydrophobic soils. Many plants, natives and even soil fungi can contribute to hydrophobic soils and is most prevalent in sandy soils. Hydrophobic soils can be improved by various methods including, increasing the clay content in sandy soils & incorporation of properly composted material into the top 10cms of the soil. Additions of beneficial microbes will also help break down the waxy material and benefit the soil overall. 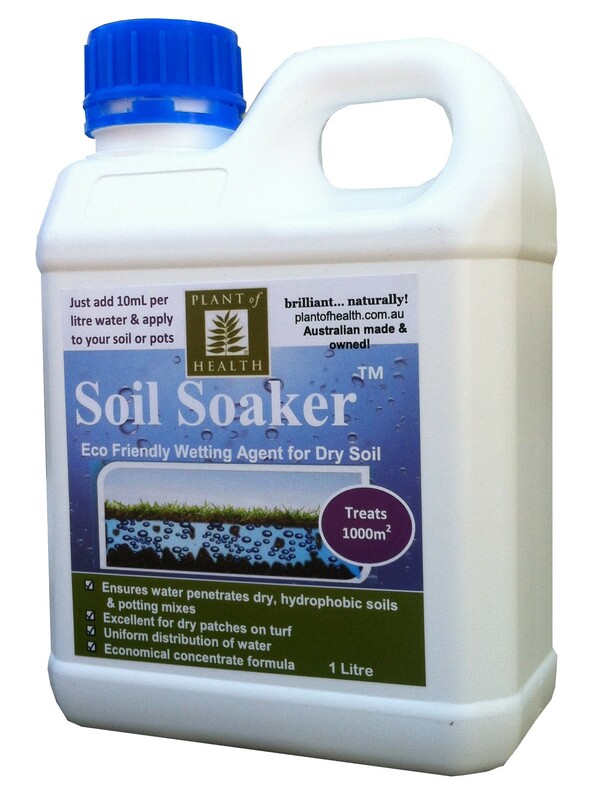 A common way to improve soils & mediums is to apply a surfactant that will reduce the surface tension of the water, helping to penetrate the soil and to disperse the water evenly through the soil or medium. Note:- Wetting agents should not be applied to mulch. Research¹ has show that it is best to allow mulch to be water repellent so water passes through to the underlying soil and so that water is not drawn up to the mulch, by capillary action, to be lost to evaporation. Figure 2:- When Soil Soaker™ is diluted; the water will penetrate the surface and disperse evenly where it’s needed most. Suitable for all soils & potting mediums. SHAKE WELL BEFORE USE - APPLY WITH EQUIPMENT THAT GIVES EVEN COVERAGE. i.e. 10mL per 1L of water per square metre. Suitable for soil, pots and potting medium. 2 Litre hose on applicator top with water and apply evenly to soil. Treats 50 square metres. Apply fortnightly or when required. Tip:- Add PlantofHealth NatraStore4™ water saver granules to soils prone to drying out. Note:-.STORE IN A COOL DRY PLACE. AVOID CONTACT WITH DIRECT SUN WHEN STORING.